I love this picture. 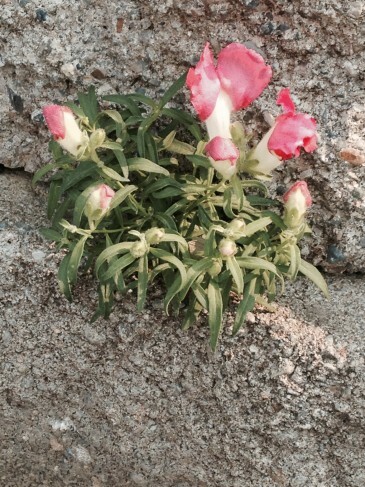 It is a little volunteer snap dragon that showed up in my retaining wall, and it is happily doing what God has called it to do in the toughest of places. And it keeps blooming! This is what good works are all about. The short book of Titus has quite a bit to say to us about good works, and I think we women need to be encouraged that so much of what we do in our homes for our families, as well as what we do for the broader Christian community, falls under this category of “good works.” We are all capable and qualified for everyday good works, works that flow out of our calling, whatever that might be. We don’t have to look for “designer” good works, but rather we should be content to offer our talents and time and energy to God to give ourselves away to the people who need us. The people here, right now. Not the imaginary people who live far away, but the ones in our lives now. That means the little people, the old people, the hungry people, even the grouchy people who don’t say thanks. God has set us apart as “His own special people, zealous for good works” (2:14). He gave Himself for us, redeemed us, purified us for Himself, and now He has given us good things to do. We are to be eager, enthusiastic, and passionate about this business of good works. Not half-hearted, not willy-nilly, but seriously devoted. This is what we’ve got so far: we are created for good works, eager for good works, ready for good works, careful to continue in good works, and learning how to keep up the good works, and especially the urgent needs. So what are these good works? “For we are His workmanship, created in Christ Jesus for good works, which God prepared beforehand that we should walk in them” (Eph. 2:10). It turns out that we were made for this, and God has already planned them for us. We are to walk by faith, expecting Him to reveal them to us as we go. At the same time, though we understand He has planned them, we are to be expectant and prepared. Kind of like a having a couple of freezer meals in the fridge, we are to be ready. Good works are work. Don’t think it will be easy! That’s why we are reminded not to grow weary in doing good (2 Thess. 3:13). No giving up. We are in this for the long haul. But remember that as we offer our work to God as service to Him, He blesses it and He blesses us. And the more we please Him, the happier we are. And the more fruitful we become, the more like Christ we become. This is so good. No matter what condition we are in, physically, financially, or bodily, there are ways to serve. I can’t do heavy work, but I like to go to my daughters-in-law houses and help with the dishes or fold the laundry. I call those my “grandma jobs” because it’s what I am able to do. They’re not hard, but save the gals a lot of time and energy when they have little ones to run after. Other women have ministered to me by being an example of holiness and an encouragement when they were the ones who were sick or heavy-laden. The body of Christ can minister and serve in so many ways. Like the picture illustrates — bloom where you’re planted! This was encouraging to me on this day! Thank you. Dear Mrs. Wilson, Your posts have been so timely and helpful to me. I have gone over them again and again. This post was helpful in layers already for me since I read it. A short time ago you posted two posts which were especially helpful also, “Shine it!” and “The Spirit of Glory.” I printed out the list of points you made in “Shine it!” to keep in the kitchen to remember and work on them. Your labor to encourage and build up women in Christ is much appreciated and I pray the Lord’s blessing on you, your family and the ministry God has given you. I am grateful for the contributions from your daughters as well. I thank the Lord for you all and the many ways He has used you in my life. Julie, thank you for your kind encouragement! Thank you ladies so much! Keep it up!